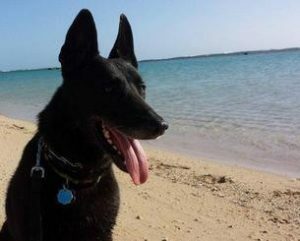 The K-9’s on this page are all supported by your generous donations. Each of them has served their country in one way or another from patrol work to explosives detection! Many have deployed multiple times and are deserving of our utmost respect! VVolt was sired by Villier and VVegas. He served a tour in Kuwait and has done POTUS and FLOTUS detail. After one training day, his handler returned the next morning to find VVolt lame in the right, rear leg. It was determined he had injured his leg and was shipped back to Lackland for surgery. While there, it was determined his other joints were headed in the same direction, so it was decided to retire him. 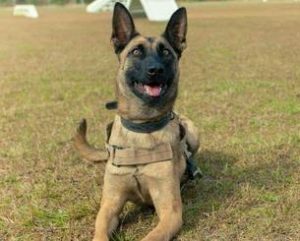 While Jetta (K402) was an active MWD, she was a dual purpose explosive detection and patrol dog. She spent many years at Fort Bragg with the most recent deployment being to Afghanistan in 2012-2013. Upon return, she was determined that she could no longer do the long patrols and began her process for retirement. Jetta has displayed numrous sympstons of PTSD to lound (bomb-like) noises. Her most recent handler discussed this with me. While we lived in NC, she had a hard time being near the impact zones. Her vet and I put her on some anti-anxiety meds. Since we live far from impact zones now, she has been taked off these medications. She still has trouble with thunder and any other sudden loud noises. She does have some neurotic behavior. Such as licking the floor compulsively. My biggest concern at this time is she is having significant hip problems. This sort of just went from minor to major in the last month. She struggles to get up and her walking is labored. I have a consultation with her vet to discuss treatment this week.